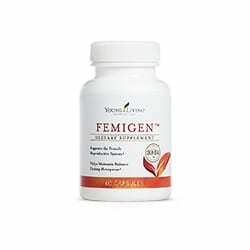 FemiGen capsules are formulated whole food herbs like wild yam, damiana, and dong quai, along with synergistic amino acids and select essential oils to supply nutrition that is designed to balance and support the female reproductive system from youth through menopause. FemiGen™ capsules were formulated with herbs and amino acids designed to balance and support the female reproductive system from youth through menopause. The natural sources of phytoestrogens: wild yam, blue cohosh and black cohosh are traditionally better than a synthetic option. Black Cohosh benefits include decreasing cortisol levels, supporting a healthy endocrine system in women and a natural alternative to promote balance. Blue cohosh has traditionally been used to uplift attitude during PMS. Dong quai is often referred to as “The Female Ginseng” for its harmonizing qualities. Keep in a cool, dry place. Do not expose to excessive heat. Keep out of reach of children. If pregnant or under a doctor’s care, consult your physician. * The information on this website is intended for education purposes only. It is not provided in order to diagnose, prescribe, or treat any disease, illness, or injured condition of the body. The author and printer accept no responsibility for such use. Anyone suffering from any disease, illness, or injury should consult with a physician or other appropriate licensed health care professional. * This site does not provide medical advice, diagnosis, or treatment.